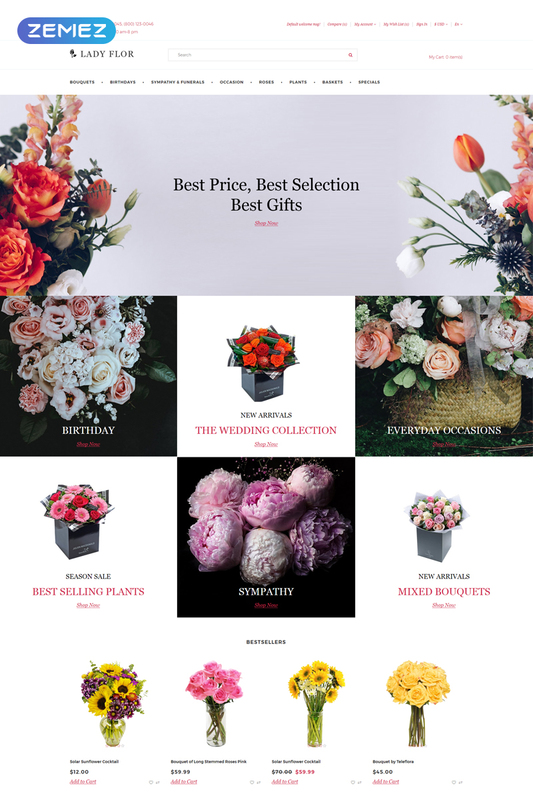 Successful florist website must be elegant, bright and full of visual effects. It has to be eye-catchy in order to attract new customers. Yet, if you want to create an atmosphere of reliability your website must work fast and without issues. In order to provide our customers with such website template, our developers created a Lady Flor Opencart Template. It has eye-catchy design and looks astonishing. Moreover, it works perfectly as an e-commerce website. Due to Opencart plugin pack, Lady Flor includes cart, wishlist, and currency options. Currency options and language options will help you to reach new clients abroad or among tourists. Lady Flor perfectly suits flower stores and gift shops. It provides customers with a comfortable shopping experience due to well-developed structure and intuitive navigation. You can also accept digital payments, use google maps, social options, and other features.